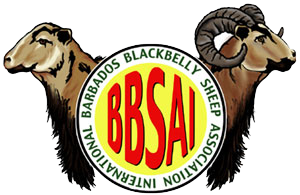 The attributes listed below describe the Barbados Blackbelly breed and should be used to evaluate sheep considered for registration with the Barbados Blackbelly Sheep Association International (BBSAI). Although this standard describes the phenotypic attributes of the breed, there are other attributes that are not easily defined but that are most valued about the Barbados Blackbelly breed. Attributes such as prolificacy, disease resistance, parasite tolerance, non-seasonal breeding, and mothering ability contribute to the integrity of the breed. The BBSAI encourages breeders to include these non-phenotypic attributes when evaluating and selecting stock to include in their breeding programs. The BBSAI does not guarantee the quality of a registered sheep. The purpose of the BBSAI registry is to enable breeders to track the pedigrees of their animals. It is the breeder’s responsibility to ensure that only sheep meeting these breed standards are submitted for registration. It is also the breeder’s responsibility to cull any sheep that are Not to Standard and to prevent their genetics from contaminating the general population of Barbados Blackbelly sheep. Ideal : The perfect sheep. This is the sheep we all want, the sheep we all strive to breed. Acceptable : These flaws are generally cosmetic and rarely are genetically fixed across generations. If the flaw does persist across generations, the breeder should work to eliminate it. Discouraged : These are serious flaws. The breeder should recognize that these flaws, if allowed to pervade the flock, will compromise the flock’s integrity. Elimination of these flaws should be a priority. Not to Standard : Sheep with these flaws should be culled from a breeding program. These flaws are detrimental to the future of the breed. The shape of the head is oval to triangular with a typical “roman” nose. 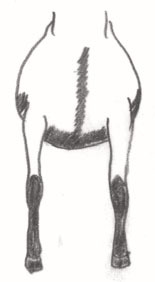 The head of the ram is distinctly masculine, and that of the ewe is feminine. The muzzle is wide and strong with firm lips. Incisor teeth must meet the dental pad. Acceptable : A ewe’s head may exhibit some less feminine coarseness, but it must still be decidedly distinct from the ram’s head. The ears are pointed and when alert stick out from the side of the head parallel to the ground. The ear length should be approximately one-half the width of the animal’s skull at the widest point of the skull. Some variation in the size of the ears is permitted. The eyes are almond shaped. The irises of the eyes can be any shade of brown or golden brown. Ideal : Sheep of both sexes are smooth-headed with no sign of any outgrowth of the horn plate. Not to Standard : Ewes with horns or scurs; rams with horns or with scurs longer than 1 1/2 in. Ideal : The neck is strong and muscular, clean cut, and without loose folds of skin. Acceptable : Occasionally, wattles are found, but are not discriminated against. The arm and the shoulder blade are well muscled. The forelegs appear straight when viewed from the front and side. A slight tendency toward splay-footedness (toes that point outward) is not uncommon. The pasterns are strong and springy. Weak, bony shoulder blades that protrude from the body. Any deviations from straight legs as long as they are minor, including such things as weak pasterns, feet that are pigeon-toed, and knees that are knock-kneed, calf-kneed, or buck-kneed. Not to Standard : Marked deviations from ideal, including but not limited to deviations that interfere with the sheep’s ability to walk normally. 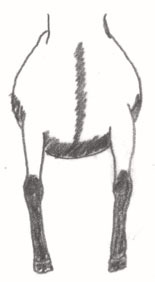 The hindquarters should be muscular with a long, gradually sloping croup (rump). 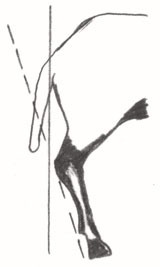 The hind legs viewed from behind should be straight. 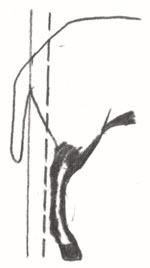 From the side view, a vertical line dropped from the posterior of the buttocks should hit the point of the hock and the back of the ankle and contact the ground 1 in. to 2 in. behind the heel. A slight tendency toward cow-hockedness is not uncommon (when viewed from behind, the ‘back knee’ or hock is set inward, resulting in a splayed look in the back legs). Discouraged : Bowed legs; sickle-hocked legs; and post-leggedness. Ideal : The hooves are cloven, black, and clean-edged with shiny smooth surfaces. Body capacity should be relatively large in relation to the size of the animal. The body should be deep and wide with well-sprung ribs. A mature ram’s testicles should be well developed. The withers are higher than and sloping into a level back. The loin viewed from the top should be broad and strong. The croup (rump) should be long and gradually sloping. The tail is long, and reaches to the top of the hocks. It follows a continuous line down from the croup without any crookedness. The coat consists of coarse hair that lies flat against the skin. An adult ram has a mane of coarse hair that covers the neck and downward to the chest. The hair coat contains sufficient lanolin to help shed water and repel ticks and other ectoparasites. If the sheep grows a winter undercoat of fine wool, that undercoat is completely shed every year. Discouraged : Small patches of wool along the topline that do not shed from year to year. Body color can vary from light fawn through brown to dark red. Points can vary but should include a contrasting black belly extending down the back side of the rear legs and including the underside of the tail. 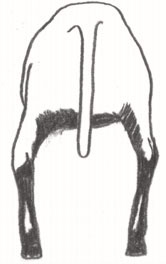 The top of the nose and the lower jaw are black and may include a continuing black stripe down the front of the neck that connects with the belly. A wide black mark runs from the inside corner of each eye to the crown of the head and may continue downward to the mouth. These markings are called facial bars. They are sometimes more pronounced in the ram. There may be an additional black mark from the outside corner of the eye to the corner of the mouth. There is a crown of black hair at the top of the head. The inside of the ears is black. The forelegs and hind legs are black downward from the knee or hock; often the outside edge of the leg is not black.